56 | TH E M R EP O RT O R I G I NAT I O N S E R V I C I N G DATA G O V E R N M E N T S E C O N DA R Y M A R K E T THE LATEST ORIGINATION Borrowers Big on Home Equity Lending Most borrowers use home equity loans for home improvement projects. F or people pursuing a funding source, tapping into the value of their primary dwelling can be a good way to get some cash. With house values mounting and the economy mending, the home equity loan market has secured a toehold over the past few years. So why do folks opt for a home equity loan over a personal loan? And what's their opinion of said loans? To gauge an understanding of current customers' perspective, LendEDU posed 15 such questions to a group of 1,000 Americans who were home equity loan borrowers. They also asked participants' opinion of the tax code changes, and got surprising answers. The survey found that 52.2 percent of survey respondents are utilizing home equity loans to bankroll home improvements since they are usually the least costly source of funding for fixer- upper projects. In contrast, 23.3 percent used their home equity loan primarily to consolidate debt, the survey indicated. That's likely because home equity loans typically offer lower interest rates than credit cards, student loans, personal loans, and car loans. On a bright note, 83.8 percent of polltakers thought the value of their home would grow over the next three years, the survey noted. Just a teensy bit fewer—81.9 percent—believed their home's value would rise over the next five years. When asked what they thought the value would down the road, however, the numbers dipped to 74.1 percent expecting it will be more valuable in 10 years and 65.2 percent predicting that their place of residence would be more valu - able in 20 years. As for the changing tax law mentioned earlier, most people don't understand it, the survey reveals. A mere 4.4 percent of re - spondents correctly identified that the law would be detrimental to home equity loan borrowers by eradicating the interest deduc - tion. And that, the survey found, could deal a blow to the home equity lending business. Millennials Jump on the Refi Bandwagon Refinance heated up at the end of 2017 for the third straight month. W hen it came to their mortgages in the last quarter of 2017, a bevy of millennials jumped on the refi bandwagon. As a result, refinanc - es reclaimed their popularity in December, Ellie Mae reported in its latest Millennial Tracker. December was the third straight month in which refinances made up 15 percent of all closed loans for millennial borrowers, the report said. That's the highest percentage of refis recorded for this group since February 2017's yearly high of 17 percent. 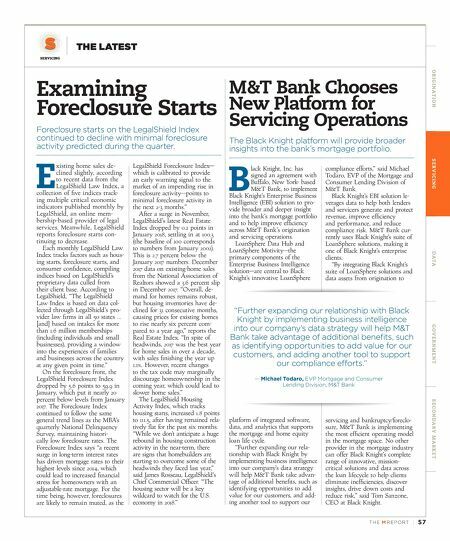 The rate of closed purchase loans hovered at 84 percent, the report noted, dropping from the 90 percent peak posted in June 2017. Conventional refinanced mortgages remained steady at 19 percent. FHA refi loans, on the other hand, continued at six percent from the previous month. Added together, the percentage of conventional and FHA purchase loans also stayed the same from November to December, coming in at 80 and 94 percent, respectively. 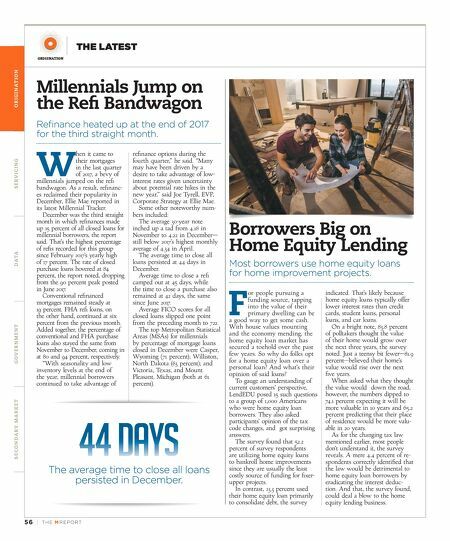 "With seasonality and low inventory levels at the end of the year, millennial borrowers continued to take advantage of refinance options during the fourth quarter," he said. "Many may have been driven by a desire to take advantage of low- interest rates given uncertainty about potential rate hikes in the new year," said Joe Tyrell, EVP, Corporate Strategy at Ellie Mae. Some other noteworthy num - bers included: The average 30-year note inched up a tad from 4.18 in November to 4.22 in December— still below 2017's highest monthly average of 4.34 in April. The average time to close all loans persisted at 44 days in December. Average time to close a refi camped out at 45 days, while the time to close a purchase also remained at 42 days, the same since June 2017. Average FICO scores for all closed loans slipped one point from the preceding month to 722. The top Metropolitan Statistical Areas (MSAs) for millennials by percentage of mortgage loans closed in December were Casper, Wyoming (71 percent); Williston, North Dakota (63 percent); and Victoria, Texas, and Mount Pleasant, Michigan (both at 61 percent). 44 Days The average time to close all loans persisted in December.